I am glad to see that you are taking emails again. I hope you are well. I have been immeasurably blessed by your blog. I have learned so much and have passed your site on to my fellow foot sufferers. Who knew there were so many of us? Being in the fitness industry, I am concerned about the high and increasing occurrence of foot injuries. Never again will I take foot health for granted. Dr Blake's comment: Sounds like we are in this together to help with foot health. Thank you. If you get a moment I would appreciate any thoughts you might have regarding my sesamoid fracture. I have become weary---I was so determined to get this puppy healed but sadly it is not cooperating. I am somewhat distressed that surgery may be looming. I am a 53 year old female. I teach elementary P.E. (I agree with your post regarding kiddos and increased exercise btw) and I am a certified Zumba Fitness Instructor. In August 2012 I doubled my Zumba Fit classes from 5/week to 10 per week. Dr Blake's comment: Golden Rule of Foot: 10% increase per week is safe, more than that we are at risk for injury. 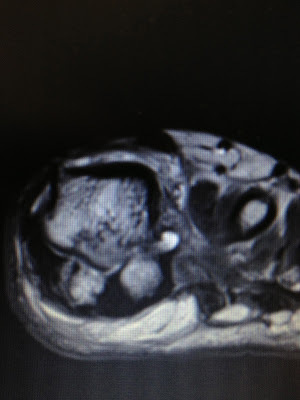 In early October I began to have discomfort in the left ball of the foot with minimal swelling on the top of the great toe joint after Fitness classes. Additionally, I regularly wore high heeled platforms every weekend to church, events, weddings,etc. I attended a wedding late Oct. and danced in said heels at the reception. At the end of October I recall a sharp pain in my left ball joint while teaching Z Fitness---doing a heel toe move. Thereafter, I began having chronic discomfort and swelling coupled with acute pain after fitness classes. I had x-rays with an unclear diagnosis; the possible beginning of both a bunion and arthritis. Dr. advised foot rest, no Z classes, shoe inserts and come back in 4 weeks. I called the 3rd week and requested the specialist to look at my X-rays as I was not improving. 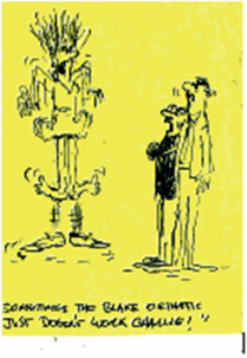 When that did not happen I went to another Podiatrist. He looked at my Nov. x-rays and said I clearly had a sesamoid fracture. Dr Blake's comment: It is good to get a second opinion when not improving, even when you plan on going back to the original treating physician. Health care providers just got to get over it!!! It is best for the patient in many ways--physically, emotionally, spiritually. He put me in a walking boot to be worn 24 hours daily. I began using an Exogen bone stimulator 2xs daily. My next set of x-rays showed no change. I upped my calcium--Vitamin Code Grow Bone and Ezorb. Icing 2-3 times daily and contrast bathing. I went to crutches and a knee scooter for 6 weeks. Major swelling and pain continued. Dr Blake's comment: Immobilization tends to thwart any reduction of swelling hoped for. The major swelling reduction comes with weight bearing, elevation, painfree massage, and motion. I would expect however the pain to be subsiding. ua I went to a TuNai therapist who aligned my ankle and foot. We watched the swelling go down in that session! Amazing!! Continued 1 weekly TuNai therapy for 4 weeks. Got a custom orthotics boot. X-rays every 3-4 weeks showed little to no change. Dr Blake's comment: After the first 6 weeks or so, the xrays lag behind the healing, and may not be very reliable. By this time, they are a waste of radiation in general. Best to go by symptoms. I slowly weaned to walking with custom orthotics in my athletic shoes and have been wearing them to date. I occasionally wear Ugg converse sneakers with purchased orthotics. I added Vitamin Code D3 and a supplement called Repairzyme. I had quit drinking diet soda and caffeine back in September for other health issues. Dr Blake's comment: It is the osteoarthritis in the joint that I am most concerning with. It suggests you have a healing medial sesamoid fracture (in some stage of healing), and arthritis in the big toe joint that may be chronic. I began having slightly increased pain and swelling in the last 2 weeks. I went last week 6/20 to TuNai therapist and she painfully pulled my big toe joint into place and I have had relief. I have 2 more sessions scheduled. I continue to ice and I have increased the Exogen to 3xs daily. I made an appointment to consult with an orthopedic surgeon. My reasons are twofold; to get a 2nd opinion and to consider surgery. Waaa! I have been adament about avoiding surgery. I am not so adamant now, but do not relish the idea of my bone removal. I am concerned about life post surgery--teaching P.E. and Z classes. No more cute wedge shoes (I know--so ridiculous) but cute converse Uggs just don't quite cut it at church and weddings (smile). Dr Blake's comment: Surgeons tend to be blind to the arthritis when they are dealing with bunions and fractured sesamoids. Do not have your sesamoid removed unless you are sure it will not continue to heal and you are convinced that the arthritis is not the major cause of your pain. 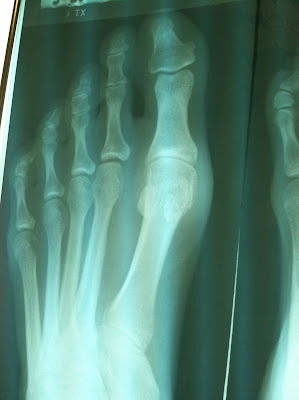 Arthritic big toe joints cause swelling to collect around the sesamoids, which make them hurt on physical examination. What do you think? Is there any chance of healing at this point (outside of a miracle?)? I understand it can take up to 1 year to fully heal and I would wait if that was happening. But shouldn't I be seeing some healing at this juncture? Dr Blake's comment: I will feel better giving you advice seeing the 6 month MRI comparison of sesamoid bone edema and first metatarsal edema. I value any input you might have Dr. Blake. 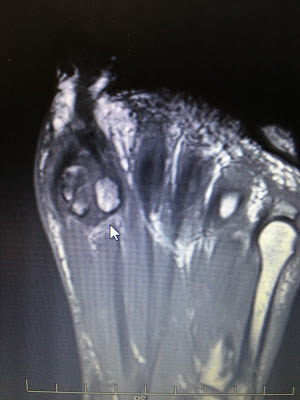 Attached are images from MRI. I truly appreciate your valuable time and expertise of my dilemma. Tibial Sesamoid Fracture showing sesamoid fracture line and line extending into the first metatarsal. I would love to see this same image in T2 imaging where the bone is black when healthy. 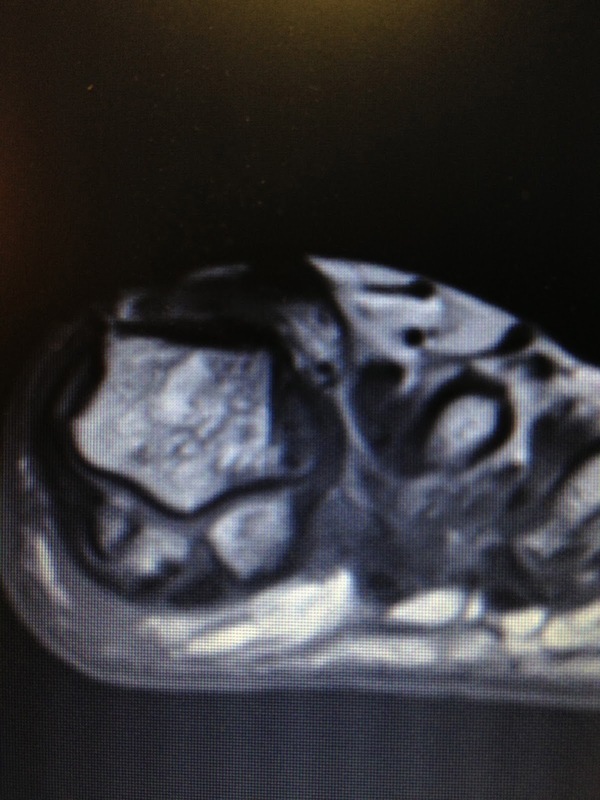 Another view of the fractured sesamoid with no break in the cartilage under the first metatarsal head. However you can see that the consistency of the first metatarsal head is irregular with bone cysts suggestive of arthritis. This is called the Eqyptian Foot with the long first metatarsal--first metatarsal length should be approximately 3 mm shorter than the second metatarsal. Long term stress to the joint occurs with that alignment. See the obvious increase whiteness of the first metatarsal to the second signifying stress. These are joints that get arthritis.